There are two different ways to uninstall the VirtualShield application from your Windows computer. Follow the instructions provided below. Open your Windows Start menu and navigate to All Apps/Programs > VirtualShield > Uninstall. A dialogue will appear asking if you are sure you want to remove VirtualShield and all components? Select 'Yes'. 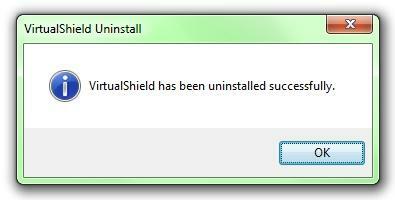 The uninstall process will complete, and display another dialogue confirming that VirtualShield has been uninstalled successfully. Open your Windows Control Panel and navigate to Programs and Features. Find the VirtualShield application in this list, then right-click it and select 'Uninstall/Change'.